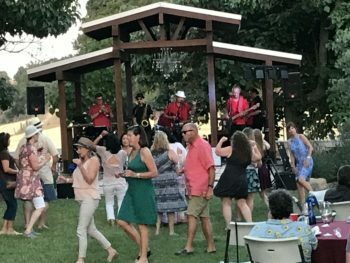 What happens when 17 winemakers, a caterer with tri tip and barbecued oysters, and a dance-inspiring band get together with about 200 of their friends? 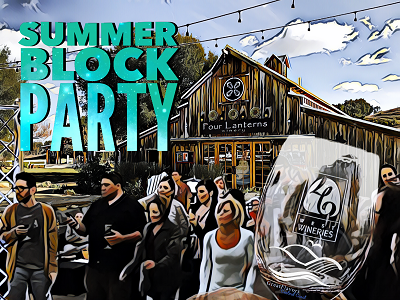 The 46 West Wineries Summer Block Party, one of the best Paso Robles parties of the summer. 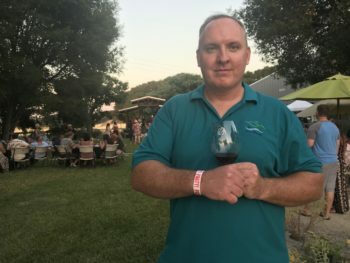 We looked at the wristbands being applied to attendees at the 46 West Wineries Summer Block Party at Four Lanterns Winery in Paso Robles. Did they foretell the future? If so, it was going to be a fun night. In red letters on the white bands were three words. PARTY PARTY PARTY. Flavor Team member Andrew sports the wristband with prophetic powers from the Summer Block Party. While it had been a hot day in Paso Robles, by the 6:30 start, the sun was heading west behind the trees and a soft breeze kept revelers comfortable all evening. 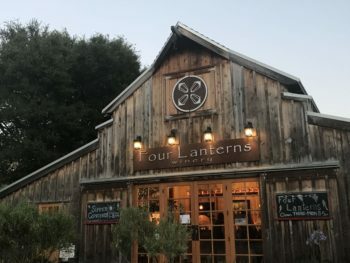 Four Lanterns Winery, which was an apple farm a century ago, was the setting for the 2018 Summer Block Party of the 46 West Wineries Association in Paso Robles. 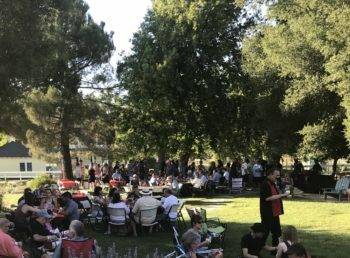 Held this year at Jackie and Steve Gleason’s Four Lanterns Winery, the event gathered a fun-loving crowd of about 200 under the shade trees and on the lawn of the historic property that got its start as an apple farm in the early 1900s. It transitioned to an herb farm and vineyard in the late 1970s. Since the Gleasons bought it in 2013, they’ve done many improvements to bring it fully into its place as a winery. 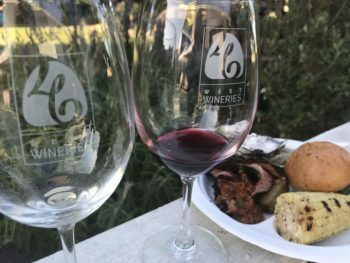 Going strong for about 10 years now, this event is a celebration for attendees as well as member wineries of the nonprofit 46 West Wine Association. 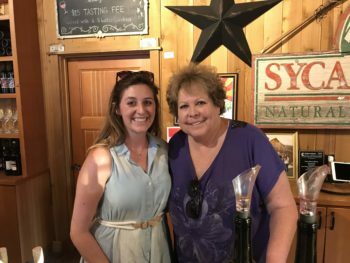 Maribeth Jacobsen, co-owner of Doce Robles Winery and founding member of the 46 West Wineries Association, and Katy Michelle, Doce Robles Winery tasting room manager, pouring inside the barn. 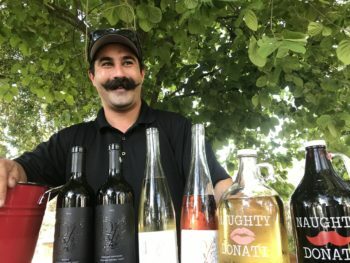 “The Block Party, which used to be called West Fest, is a chance for the wineries to share their wines with people who enjoy them,” said Maribeth Jacobsen, co-owner of Doce Robles Winery, and one of the founders the Association. “It also gives winery staff the opportunity to talk, catch up, enjoy dinner and music, and really celebrate what we all do,” she said. With prophetic wristbands attached and souvenir wine glasses and dinner tickets in hand, we joined the happy crowd. Many were sitting at tables, and several had brought blankets or lawn chairs to get a good seat for the band. Some were already eating dinner; others were starting the evening with a glass of wine. Block Party-goers relaxing on the lawn area of Four Lanterns Winery. Of the 17 member wineries pouring during the Block Party, most were set up in two rows flanking the lawn. A few more were pouring inside the lovely barn-turned-tasting-room. Many of the 17 wineries were pouring outside, including Mitch with Donati Family Wines. After making a reconnaissance circle around the winery tables outside, we got our first tasting from Midnight Cellars inside the tasting room. Then it was time to meet the team at Paso Catering and try their tri tip, barbecued oysters, salad, potatoes, and roasted corn. 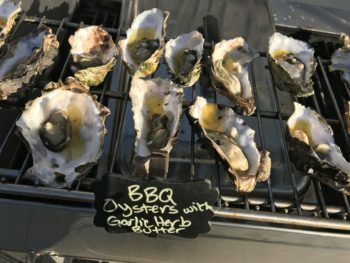 Barbecued oysters and tri tip were on the menu from Paso Catering. Balancing plates on the railing near the bandstand, we waited for James Scoolis’ group Burning James and the Funky Flames to kick off the evening with music that drew a steady crowd of dancers. Burning James and the Funky Flames got the dancing crowd going all evening long. From there, everyone had the same, simple agenda for the evening: tasting wines and enjoying the laid-back and completely relaxing environment of the Summer Block Party. We found one of the nicest things about this event was the ease: no long lines, no huge crowds, no pushy partiers. Just a positive group of people who enjoy the best of what the Central Coast has to offer. Wine, food, music. Fun. The Summer Block party shares great wine, food, and music for a relaxing and fun evening. If you made it to this year’s event, what were your favorite memories? If you didn’t make it, don’t despair. The 2018 Harvest Block Party, to be held at Dark Star Cellars on September 1, promises to be another enchanting evening. The Flavor Team thanks the 46 West Wineries Association for creating the event, the member wineries for sharing your great wines (see full list below), Four Lanterns Winery for hosting at your lovely property, Paso Catering for the great food, and Burning James and Funky Flames for music that makes you smile (and dance).